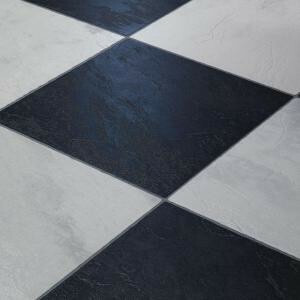 Having a floor with the beautiful look of real stone is affordable and easy to install with this Innovations Black and White Chess Slate Laminate Flooring. You'll get textures and a random pattern that capture the beauty of stone. This flooring comes with an attached underlayment to reduce noise under foot. Each tongue-and-groove is fully sealed to help prevent moisture penetration, and the patented JointGuard technology protects joints from chipping. Innovations floors are also GREENGUARD Certified for Low Emitting Products, providing an environmentally friendly solution for your flooring needs. 18.56 sq. ft. per case. Case quantity: 5. Case weight: 30.10 lb. Buy online Innovations Black and White Chess Slate 8 mm Thick x 11-3/5 in. Wide x 46-1/4 in. Click Lock Laminate Flooring (18.56 sq. ft./case) 904073, leave review and share Your friends.